Well the end of the year is rolling around and it’s time to roll out the Palaeo Project Challenge. It’s a bit late this year as, well Andy and I forgot quite simply. We had it all planned and ready to go after Vegas and then, errr, nothing. Still, better late than never and there’s still a month to go, so we’d suggest only small projects this time around. 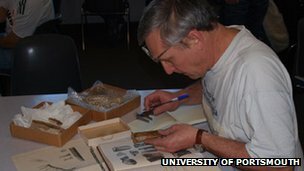 For those not familiar, the idea is for people to sign up to challenge themselves to get some palaeo-related work done. Everyone has a paper they never finished, a long overdue review hanging over them, a stack of ‘must read’ papers that have been there for 6 months, or some data to enter. Those little things that are always needing doing but never quite get high enough up the priority list. Well, put them to the top and declare them as such and get things going. Simply leave a comment below in the thread and let us and the other readers know what it is you plan to do. Obviously there’s no real commitment here, just you wanting to get it done and a bit of peer pressure once you have announced it. So, trawl that hard-drive and sort through those piles of papers and think about what needs doing. This is open to all, not just academics, so you artists can get those pictures finished and interested people go to the museum you intend to or buy and read that book you’ve been eying up. You have until the 1st of January, so get going! Oh yes, and do please spread the word of this on your blogs etc. I am 100% behind Mat Wedel’s famous rant about computers in museums. People got to natural history museums to see natural history. But of course that doesn’t mean that a good computer display etc. cannot enhance what is already there in front of you, providing details and layers and depths not available with a traditional static sign. 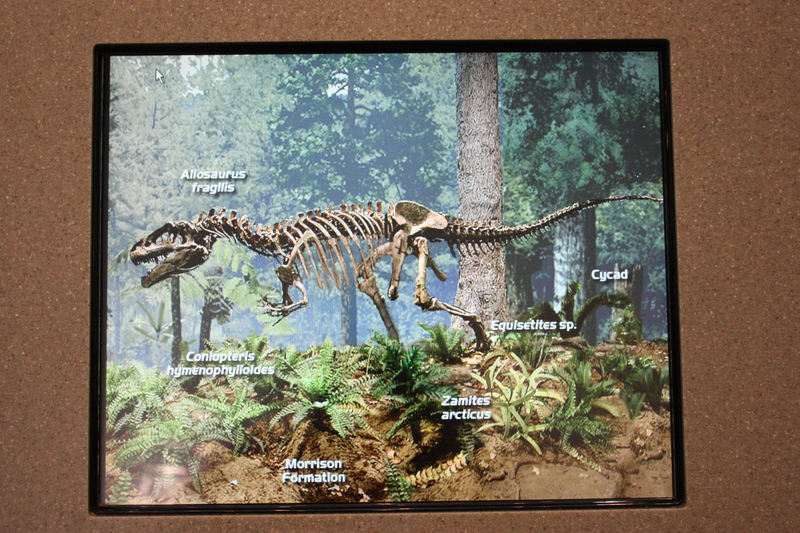 And here is an example of this being done well, it’s a single page about the Allosaurus display the the Carngeie. The image is crystal clear and it’s of the section of exhibit right in front of you, so no confusion over where to look or in identifying things. It clearly identifies the dinosaur and the Morrison Formation, but also reveals that all those lovely plants around the skeleton are not just set dressing but actual representations of fossil plants that were around at the time, and have names and are known from specimens etc. It helps bring things together and for people to see an appreciate the depth on dispaly and learn more from it than they might otherwise. All in all, great stuff. 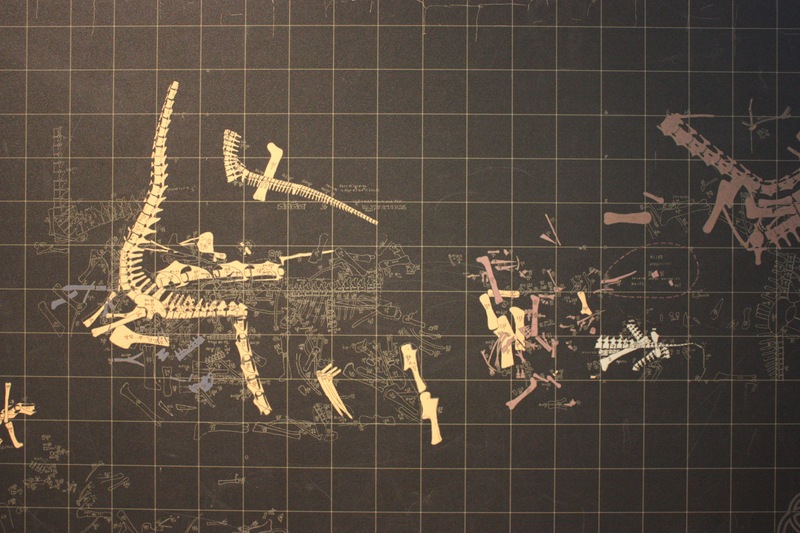 One thing on display at the Carnegie was something I’d never seen before – a complete quarry map for a major dinosaurian bone bed that yielded numerous fossils. 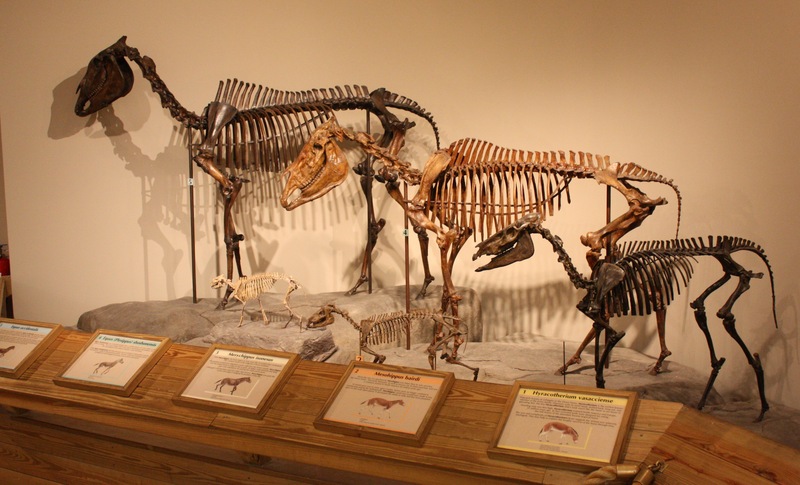 Here they all were, catalogued, labelled, and colour coded, and with reconstructions of the animals (at the time) put below. This was part of much wider series of signs about the history of excavation of the Morrison and recovery of dinosaur material (including those in the exhibition halls below – this is on a balcony overlooking the Jurassic section) which couldn’t really be photographed becasue of the layout. Still, it was very good (as far as I could tell, I didn’t have time to read it all sadly, but what I saw was detailed, interesting, well written and well illustrated) and it was nice to see a sign with real detail – this is something, if you had the time and motivation, you could read for probably 20 minutes and learn a great deal, and it’s nice that you *can* do that, even if few people ever will (though i appreciate it’s position is near perfect, out of the way enough that several people really reading the whole thing won’t obstruct the crowds where it would in other places). It is, of course, also nice to put a historical spin on things, though again the Carnegie collection has rather more history than many collections thus in part perhaps why this works so well here. It’s easy for us to focus on the science when it comes to science in a science museum (and you can see why!) but there are other aspects to our field like history. It’s worth remembering that other people may be interested in things like this, and it can be a window to drawn them into the subject and get them more interested and involved when otherwise they might not. Sometime ago I covered the fantastic series of whale skeletons in the Tokyo Museum and how useful they were to show such a classic evolutionary series as forms adapt and change from an ancestral animal to one far more familiar to people that exists today. The Carnegie has a different version, but one no less often used in text books and websites to illustrate evolution, the origins of the modern horse. Here are a selection of skeletons and with some excellent signs pointing out key transitions etc. and showing how various features have changed. This is rather less dramatic than the changes undergone by whales of course, but then the increased familiarity of the subject makes it perhaps the better study. Either way, it’s great to see. A non-ornithodire! Woo. Still a short post though, sorry. This is a superb mount of Leptosuchus (errr, well I think so, forgot to check) Redondasaurus (though see the comments thread) from the Triassic section of the Carnegie. It is nice to see things other than the dinosaurs and pterosaurs (or icthyosaurs and plesiosaurs for that matter) get a look in, and this was something I’d never seen before. Oddly enough I have a nice schematic of the skull that I stole form somewhere years ago that I use in a lecture to emphasise some of the issues in creating characters in cladistic analyses and convergences. This does have a pretty crocodilian-like snout and is certainly a good candidate for a classic piece of convergence in morphofunction. But here it is the premaxilla that has elongated, whereas crocs generally have a short premaxilla and most of the elongation comes from a long maxilla. Thus there is a clear difference in the manner in which the lengthening has happened. And from a cladistic point of view therefore, there is a big difference between a character along the lines of “elongate snout” and “elongate maxilla”, the former unifying the two, the latter separating them. Yet another Carnegie mount I’m afraid. Those who have been to the museum since the refurbishment are probably getting sick of them by now. But this was truly fascinating for me because despite my travels in Europe and Asia, we simply don’t have many American classics over here and getting to see them all was superb fun and an education. So I’m afriad you’re stuck with this for a few more weeks as I have yet to hit up all the theropods, or the ceratopsians and I want to cover the museum as a whole and some of it’s other superb exhibits. For now though, you’ll have to be content with a Herrerasaurus. This is one of those somewhat ‘benchmark’ taxa that crop up again and again in phylogenies as the outgroup because it’s nice and old and nice and basal and nice and complete, all the things you want really. Even so, it has moved around a bit in various analyses especially early on, and I recall a time where (a little like Archaeopteryx now) each new analysis seemed to place it slightly further up or lower down than the last one, and while it never moved far it dotted around the base on the dinosaurs, just outside Dinosauria, as a basal theropod etc. That last position seems to look like it’ll be the settled one, but with new things like Panphagia and Eoraptor turning up, it can always move again. Cuspicephalus scarfi from the Late Jurassic Kimmeridge Clay Formation of Dorset is one of those irritating fossils. It was clearly a beautiful animal, with long, slender jaws and fine teeth that would have made it look impressive. It is without doubt a cracking fossil, displaying a near perfect right lateral outline, with only a little bit of the dorsal rest missing. OK, it is sad that the lower jaw and rest of skeleton is missing, but in the UK, this specimen is the best thing since the second specimen of Dimorphodon was discovered in the Lower Jurassic in the mid 1800s. But despite its near completeness for a British pterosaur skull, it is not entirely clear where it belongs in the grand scheme (or schemes), of pterosaur phylogeny. 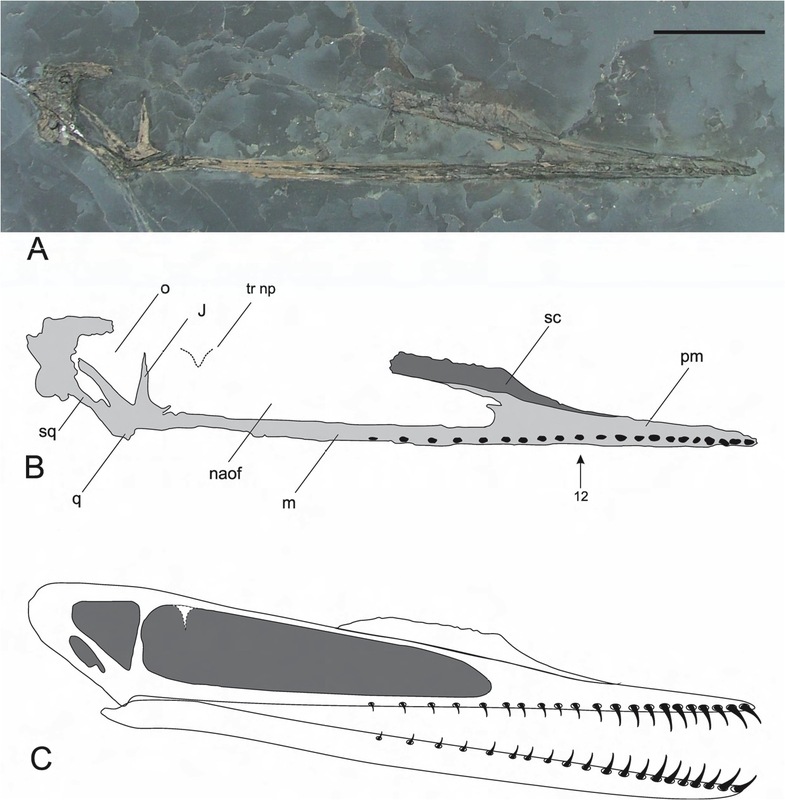 It appears to be a pterodactyloid similar to Germanodactylus on the basis of its single NAOF and straight dorsal border, but when compared with Darwinopterus, its affinities become less clear cut. Sure, it isn’t Darwinopterus, but it isn’t Germanodactylus in the strictest sense either. Dave Unwin thinks it might lie close to the base of Dsungaripteroidea, and I am inclined to agree, but caution that this is based mainly on the nature of its crest… not a good criterion given the distribution of elongate fibrous-looking crests in Pterosauria. 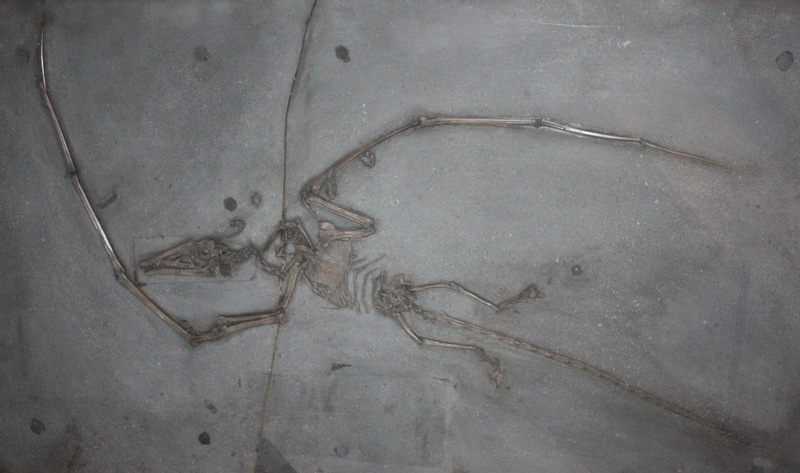 Cuspicephalus was discovered by Steve Etches. Known to most UK vertebrate palaeontologists, Steve collects fossils exclusively from the Kimmeridge Clay of Dorset and has built up a renowned collection housed in the Museum of Jurassic Marine Life (MJML) in Kimmeridge, Dorset. Steve discovered Cuspi on the wave cut platform in Kimmerdge Bay and reckons that one more tide would have destroyed it. Steve has found several other pterosaurs in the Kimmeridge Clay, some of which are represented by associated remains attributable to an animal close to Rhamphorhynhcus, and currently being examined by PhD student Michael O’Sullivan. A few specimens in Steve’s MJML have been identified as representing a germanodactylid by DMU, and it is possible that these elements are from the same animal as Cuspicephalus: clearly Steve needs to get out and find the complete skeleton. (Late edit: bonus images courtesy of Dave). The name Cuspicephalus is derived from the sharp pointed nature of the skull in lateral view, and I suspect in dorsal view too, but Kimmeridge Clay fossils are rather 2D to tell. The specific epithet honours Gerald Scarfe CBE. Scarfe is known to most UK citizens as the artist who provided the caricatures for the intro to the extremely popular satirical TV series Yes Minister and follow up Yes Prime Minister. Both were excellent lampoons of the UKs higher civil servants and mainly incompetent elected politicians. Globally Scarfe is known to several generations of Pink Floyd fans as the artist behind The Wall (album, film and more). To readers of certain newspapers and periodicals Scarfe is loved or laothed for hard hitting political caricatures, and in particular those of British Prime Ministers and other notorious world leaders. Many were reproducible in daily newspapers, but others remained within the underground literature for reasons of decency (check out Rupert bear ****ing Mary Whitehosue with the Pope watching on). One cartoon of Scarfe’s that stands out is a caricature of Margaret Thatcher, an ex British Prime Minister who Scarfe Portrayed as a Tory blue, saggy-breasted pterodactyle, and therefore it seemed only fair that he should be honoured. 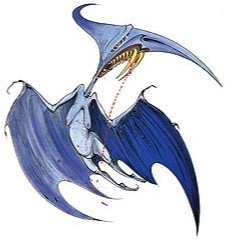 Scarfe’s cartoon might have the number of fingers wrong, and he might have followed the Frey and Riess model for the orientation of the pteroid, but we all know he got the colour right. Bit of a late one today! I’m slipping. 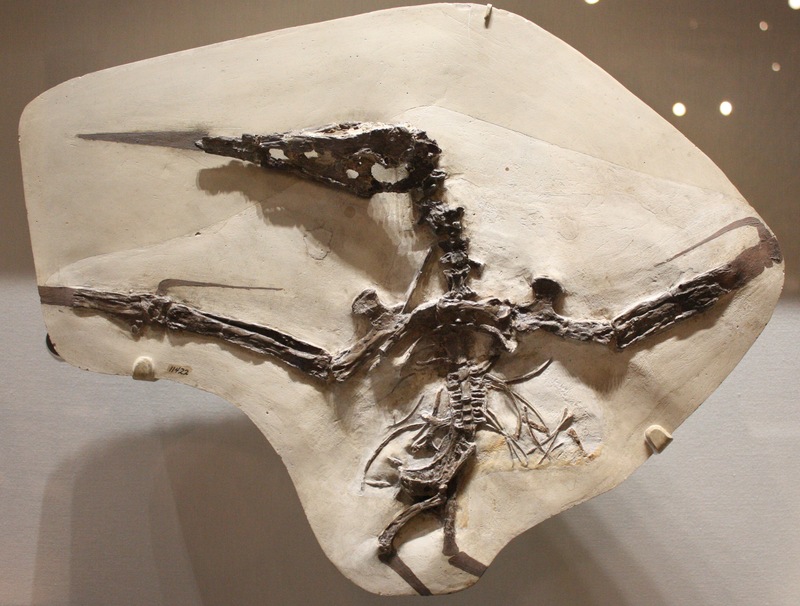 Anyway, this is the horrible-to-spell Campylognathoides, a basal non-pterodasctyloid pterosaur known from Lower Jurassic beds. This is an especially nice specimen that’s on display in the Carnegie (how did you guess) and shows off things like the sternum which is all too rare for pterosaurs. 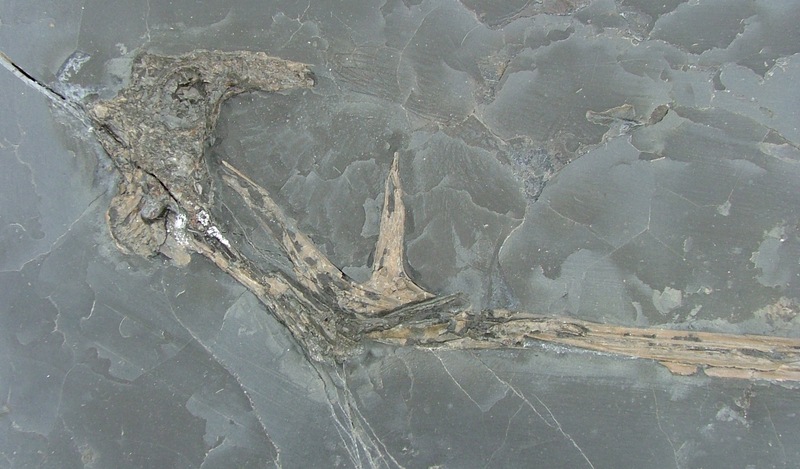 One thing Campylognathoides does give me the opportunity to talk about is pterosaur systemtics. Those in the know will be aware that for about a decade now there have basically been two competing pterosaur phylognies that have fundamental differences and never seem to meet in the middle (though there have been suggestions that Darwinopterus might just fix this issue). However, as Dave Uniwn is fond of saying (and quite rightly) for all that people highlight the disagreements between these phylogenies, there is really quite a lot of fundamental agreement, and the two trees are in a lot of ways really pretty congruent. One thing that is certainly common in both is the sister-taxon relationship of Campylognathoides with Eudimorphodon and that at least is one thing it appears pretty much everyone agrees on. 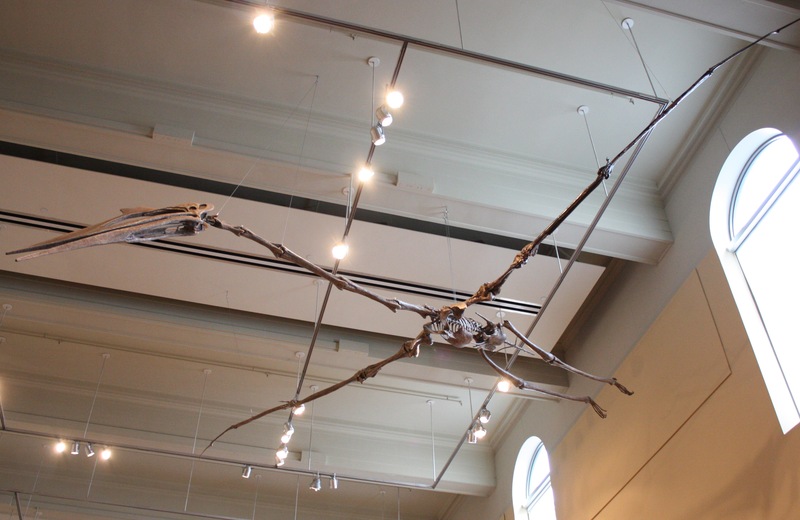 There are various mounts of this giant pterosaur around the world. I’ve seen versions in Germany and Mexico and I know of a couple of others that are out there. I have even managed to get one photo on the Musings before, but usually the things are so big and so close to the ground that there’s no way of fitting much into a photo. This one is nice and high up however and it’s possible to show off the whole thing (though ironically, once you do, it’s so huge that many of the bones look tiny). At the Carnegie, not only is this so elevated you can get a real appreciation of it, but thanks to the presence of a balcony, you can see it in something approaching a lateral view which is a novelty for me, and certainly changes your perspective. More pterosaurs, and this time a whole Pteranodon wing (and a few bits fo the shoulder too). Even without a scale bar you can get an impression of how large this is as it reaches across the entire cabinet and of course hence the split is the glass. Its about 2 m or so across and as such was from an animal or more like 4 m in wingspan. 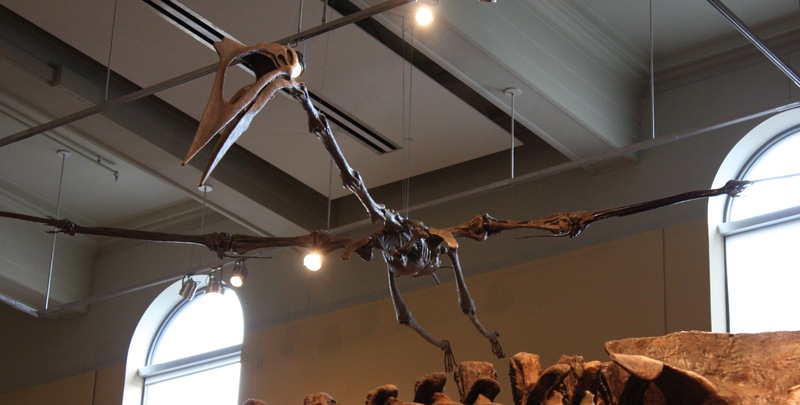 Incidentally, pterosaur wingspans are generally calculated by simply doubling the length of one wing (humerus, ulna, wing metacarpal and the wing phalanges). This might sound like an underestimate (after all, the body is in there for starters), but in fact not. Since the arm is held somewhat crooked, and the wing finger was not held at 90 degrees to the torso, this accounts nicely for the lack of the chest. At the very least it’s quick and convenient and probably generally quite accurate, and of course it allows us to use isolated wings etc. to compare them to other, more complete, remains. I say ‘nice’, but actually this is really good. Nyctosaurus material is rather few and far between and this is certainly one of the better specimens. I’ve mentioned nyctosaurs a couple of times before and even among pterosaurs they are rather strange beasts, not least for having lost digits 1-3. The Carnegie actually has some nice pterosaur material on display (always a good thing) and having overloaded the Musings with various parts of their dinosaur exhibits, it seemed a good time to get back to some (more) of their pterosaur-y goodness. As you can see this specimen is largely in 3D (unlike much other stuff from these beds) and the skull, while bashed up, is especially nice. Other things like the legs and wrists are rather more informative than you might expect too. One thing worth noting is that this specimen was mentioned specifically by Chris Bennett as very likely *not* having a massive head-crest. It seems not all Nyctosaurus bore the ‘antler’. You wait years for a Musings croc post and then get get two withing a couple of months. Who’d have guessed eh? 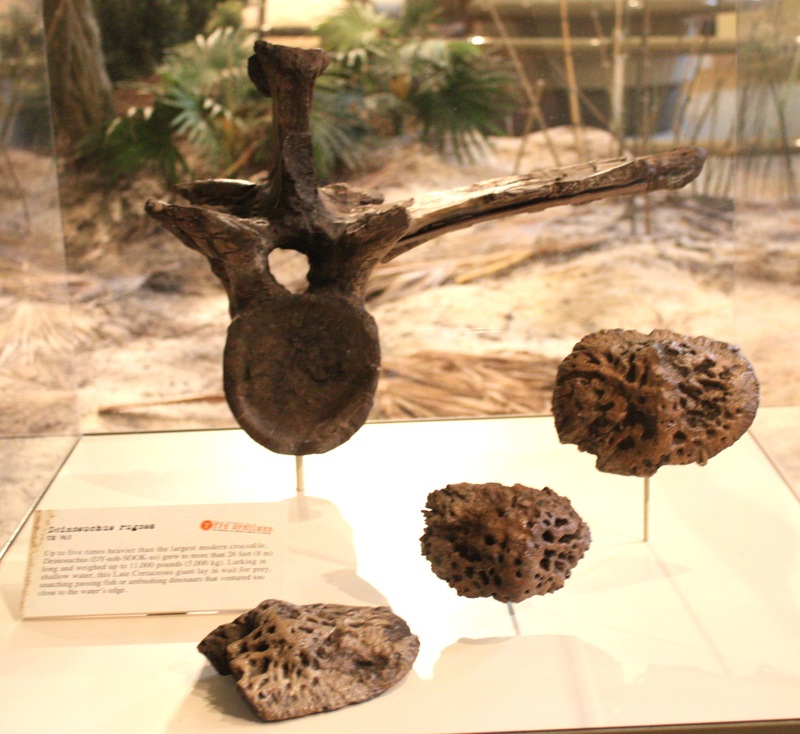 Well, none too exciting given the lack of scale bars and all since it makes it harder to appreciate just how big these are, but this is a dorsal and some osteoderms from the colossal croc Deinosuchus. The north African Sarcosuchus seems to get all the press, but this animal was of similar size and has a more typical (and thus likely more powerful) skull than the rather gharial-like Sarco. As noted, it’s hard to appreciate here, but the biggest osteoderm was about the size of my hand. This was a really serious animal.